DERBY NEXT TO HUMBLE CHELSEA? 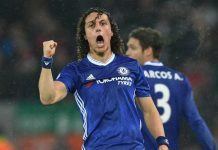 Home Matchday Match Previews DERBY NEXT TO HUMBLE CHELSEA? Out of the FA Cup to Barnsley, a manager edging closer and closer to the cliff’s edge with every bad result, a team filled with unrest and uncertainty, fans unhappy and at times vitriolic. It’s been a bit of a bad week for Chelsea. Any light on the horizon? Any silver lining for this cloud draped over Stamford Bridge? Wait…What’s this approaching SW6? Is this what we have been waiting for? All in white, are they angels? Carrying with them just ten points? Oh that’s right…It must be Derby County, the Premier League whipping boys, Championship-elect since August, the team which could make us all smile once again. The side with just one win all season (and that was against Newcastle so it doesn’t really count) currently sit a huge 16 points from safety, and with manager Paul Jewell believing in the ‘stick’ approach to motivation rather than the ‘carrot’ (virtually lambasting his squad after each and every defeat), the Rams must be dreading this one, even after Barnsley pretty much turned us over on Saturday. Avram Grant must show his supposed managerial credence and get the team playing again after THAT night at Oakwell, and while he does have injuries to contend with-Petr Cech is still out with an ankle problem-the squad is still supposedly strong enough to deal with anything thrown at it (just not crosses, eh Carlo). Didier Drogba, Frank Lampard, Claude Makelele and Ashley Cole were some of the big names left out of the FA Cup tie, and will be hoping for a recall against Derby. Meanwhile, Derby’s plight has got just that little bit harder recently, with the news that mercurial youngster Giles Barnes will miss the rest of the season with a knee problem. Dean Leacock should also sit out the trip to London with a hip injury, while there are long-term issues over the fitness of Danny Mills, Claude Davis, and Tyrone Mears. Everyone’s favourite Welshman Robbie Savage could be set for a recall to the Rams line-up, so get your voices warmed up now for the inevitable sing-song which accompanies him to opposition grounds! We played Derby back in November, when they were still probably only 90% certainties to go down. We helped them on their way to relegation fodder though, with Shaun Wright-Phillips adding to Salomon Kalou’s first-half goal to give Chelsea a 2-0 win. Michael Essien was also sent off late on. The last time the two sides met at Stamford Bridge was a far closer affair, back in the bad old days when the Blues would beat a big side only to lose a week later to one of the smaller teams, like Charlton, Southampton, and Barnsley…Oh hang on, it’s starting to sound familiar. Anyway, back in March 2002, John Terry’s 50th minute opener was cancelled out by a Branco Strupar goal for the Rams just ten minutes later. Chelsea pushed on for a winner but with time running out, the three points seemed unlikely. Then, with less than five minutes on the clock, up stepped Emmanuel Petit to send a deflected shot into the back of the net, and Chelsea into fifth place in the table…above Leeds! 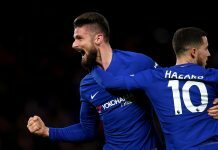 Derby haven’t beaten us at the Bridge for 25 years while their last win against anyone in 90 minutes came 178 days ago with a 1-0 victory over fellow strugglers Newcastle United. With Chelsea in possession of such an imperious home record, and Derby written off as absolute no-hopers all season long, is anyone else thinking what I’m thinking? It would be the upset of all upsets (to beat the previous upset of all upsets that is), if Derby got a result at the Bridge, and one which would have huge repercussions all over the footballing world, not least in the boardroom and manager’s office at Chelsea. Another small hurdle ahead, let’s hope we don’t stumble and fall again. Prediction: Why am I so nervous? Derby at home should be a game to look forward to but I’m here sweating over a shock result which hasn’t even happened yet! Predictions are difficult nowadays with the team about as erratic as a Claude Makelele shot, but surely we’ll win this. Hopefully it will settle things down a bit and with the run-in fast approaching, the winning must start here. 3-0 Chelsea depending on who plays, how they play, and how bad Derby actually are.